Recently, I hosted a dinner party with some close friends and family. Their food preferences ranged from strictly vegan to carnivore, and I had to think of an all-around crowd pleaser. My mind was all over the place, flooding with various options that I could possibly make to please everyone. So I stumbled upon this delicious recipe that I found on Cheeky Kitchen and I knew it was “the one”. I couldn’t believe there was a lasagna recipe made without cheese or pasta, but rather with sourdough bread, spinach and eggplant! I mean, the recipe had me at bread! So I made this lasagna and I knew the recipe was a hit when I went to go back for seconds and the entire tray was gone! Not only did the vegans love it, but my huge bodybuilder friend (that believes meat must be present at every meal) couldn’t stop eating it! So, if you want everyone at your next dinner party ranting and raving about the meal, be sure to try this recipe. Just have another tray made in case you run out like I did! In a large pot, heat 3 tablespoons of the olive oil and add 1/3 of the garlic cloves. Cook for a few minutes, then add the whole-peeled tomatoes, 1/4 cup of basil, salt, and the Italian seasoning. Let cook for about five minutes, then blend with an immersion blender (if you do not have an immersion blender, buy crushed tomatoes). Simmer for about 30 minutes. Peel and slice the eggplant and place baking sheet lined with parchment paper. Drizzle with 1/4 cup of olive oil, salt and pepper, and put in the oven until golden brown (approximately 30-35 minutes). Spray each side of the sliced bread with the olive oil cooking spray. Toast the slices in a skillet and put off to the side. Heat up the remaining oil in a pan, add the rest of the garlic, and saute for a few minutes. Add the spinach and cook until wilted. In the bottom of a glass baking dish, pour 3/4 cups of the sauce. Place 5-6 slices of the sourdough bread to cover the bottom. Pour another 3/4 to 1 cup of sauce over the bread. Layer eggplant-spinach-eggplant-spinach. Place an additional 5-6 slices of sourdough bread on top. Cover completely with approximately a cup of sauce. 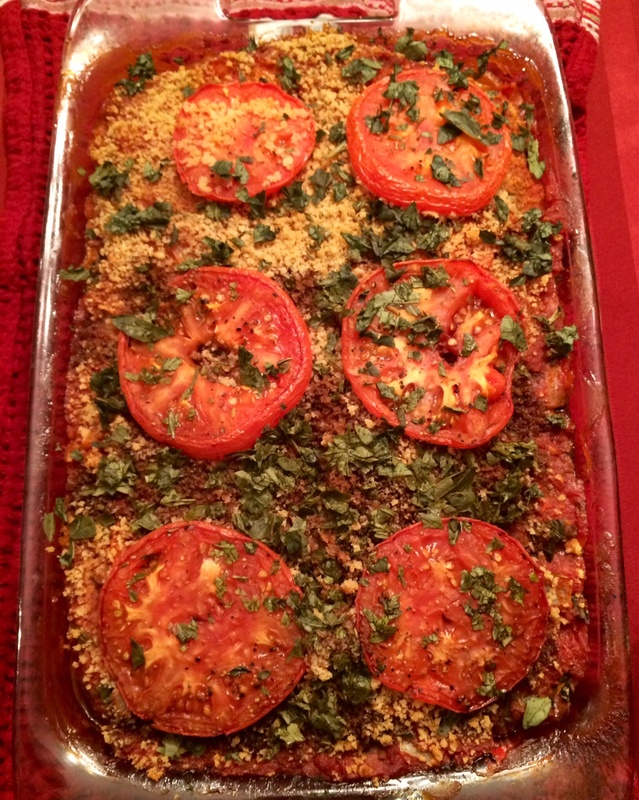 Sprinkle with whole wheat Panko crumbs, place 6-8 sliced tomatoes on top. Salt and pepper to taste. Bake for 45 minutes. Remove from oven and let it cool for about 10 minutes before drizzling with the balsamic vinegar and garnish with basil. Serve with a nice Pinot Noir and enjoy!